Chili with meat. Chili-con-carne literally means chili with meat. This may not be a true hand me down Taste of Southern recipe from my family heritage, but every once in awhile, you find a recipe that you just want to try out. You may not know exactly what intrigues you about it, you just know that you want to cook it and see what it tastes like. 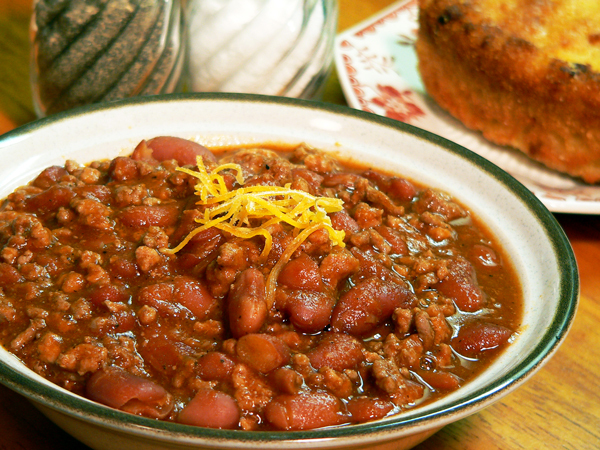 Thus….today….I present you with Baxter’s Chili-Con-Carne Recipe. Let me explain. I’ve become pretty much addicted to attending a local auction house each Friday and Saturday night. Friday night is designated towards new stuff, and Saturday night is classified as Antiques, Collectibles and Old Stuff night. I much prefer Saturday night, but I’m usually in attendance on both nights. And, I must add, I bring home WAY too much stuff. On one particular Saturday night a few months back, I purchased an older book at auction. The book is entitled “STARSTRUCK – The Wonderful World of Movie Memorabilia.” It was published in 1986, written by Robert Heide and John Gilman. In short, it contains lots of color, and black and white pictures of old movie posters, signs and more, with movie stars from long ago. Since my very first job ever was working at our local movie theatre, this kind of stuff fascinates me. I’m not a big collector but I do have a few old movie posters of my own along with some other items of interest. Mostly, I was able to pick up this hardback book for $2.00 so I went for it. I’ll quickly admit that I’m not much of a book reader, just give me one with lots of pictures. Glancing through this book, there is a section on the Movie Star Magazines that were popular as I was growing up along with some earlier items. If you remember when you use to be able to buy ice cream cups that had pictures of movie stars inside the lids of those cups, then you might be a bit older than I am. I do remember them, but just barely, and there is an article about those in the book also. Among the sections were a couple of pictures about movie stars and their recipes. 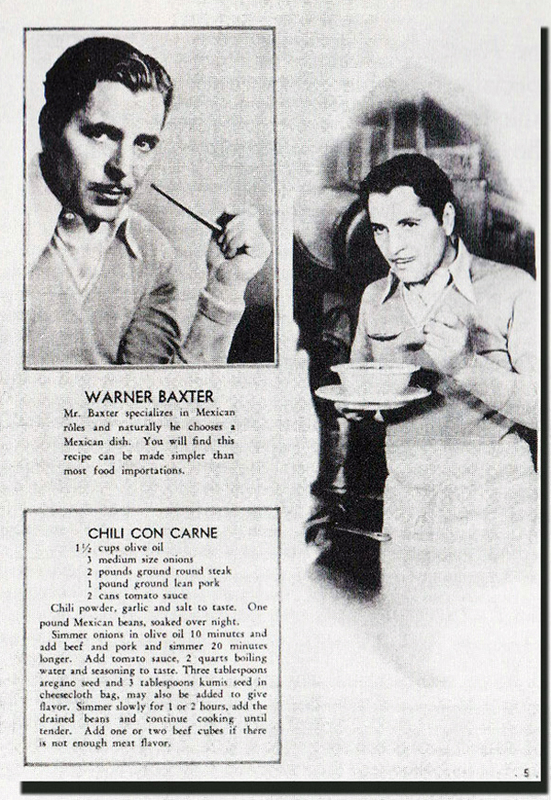 One of the recipes said it was “Warner Baxters own recipe for chili con carne.” It just kind of caught my attention. I had just started work on this website back then, and thought I’d give it a try. As it turned out, it tasted pretty good and was simple enough to make, so I decided to add it to the site. About the only chili we ever had around our house was hot dog and hamburger chili. I don’t recall my mom ever making just chili with beans. If she did, it wouldn’t have been one of her regular dishes or I’m positive I would have remembered it. 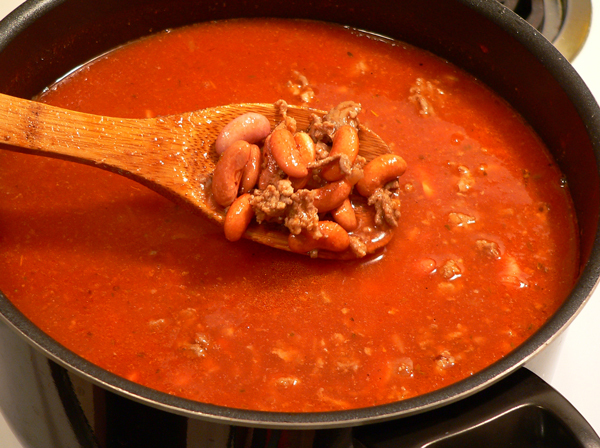 Chili con carne is said to have originated in Texas. Thus, it’s an American dish according to Wikipedia and you’ll find it served in many restaurants throughout the South. If you’d like to read more, you can read the latest information posted by Wikipedia by Clicking Here. By the way, Warner Baxter was indeed a very popular movie star back in the day. He was an American actor best known for his role as The Cisco Kid in the movie “In Old Arizona.” He won the second Academy Award for Best Actor in the 1928-1929 Academy Awards. He has a star on the Hollywood Walk of Fame and was somewhat of an inventor as well. He first appeared in Silent Films but later moved on to the “talkies,” as you can see by the poster above. 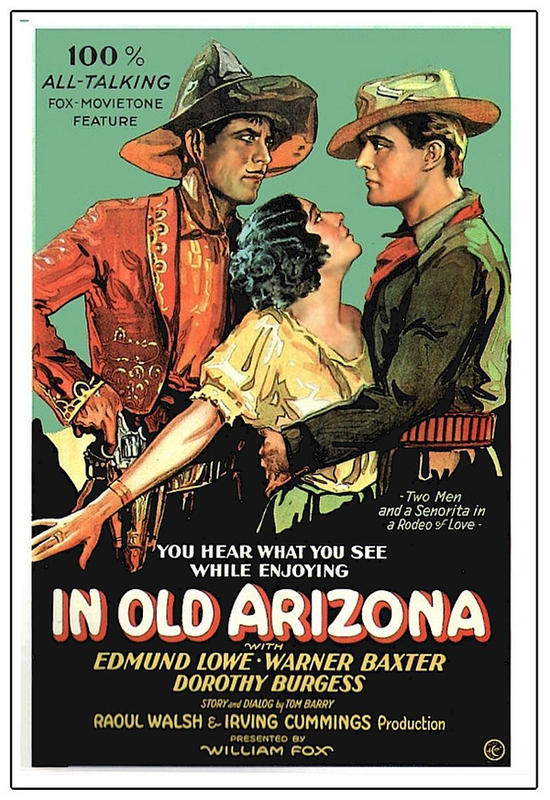 You can learn more about him at this link… Warner Baxter. Baxter was rather handsome so I’m sure the ladies all liked him. Looks a bit like Clark Gable if you ask me. Here’s a scan of the article and recipe from the book. Please note that I totally did NOT start out with the one and a half cups of Olive Oil, nor did I use three onions. I made a few slight changes, but the recipe I’m offering here is adapted from the above recipe. As I mentioned, this is a pretty quick and easy meal to prepare. It does require soaking the beans overnight so keep that in mind. I think you’ll like it if you give it a try. I know there are thousands of variations on chili so I’d also be interested in learning about your favorite recipes for the same. If you’re ready… Let’s Get Cooking! 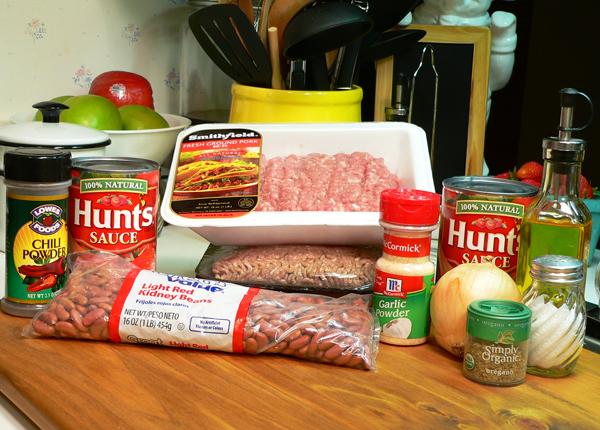 Baxter’s Chili Con Carne Recipe: You’ll need these ingredients for my adaptation of the recipe. 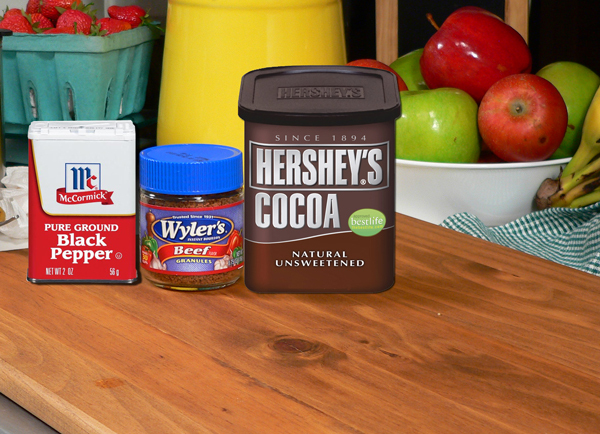 Secret Ingredients: You’ll also need some Black Pepper, Beef Bouillon Granules and Cocoa Powder. 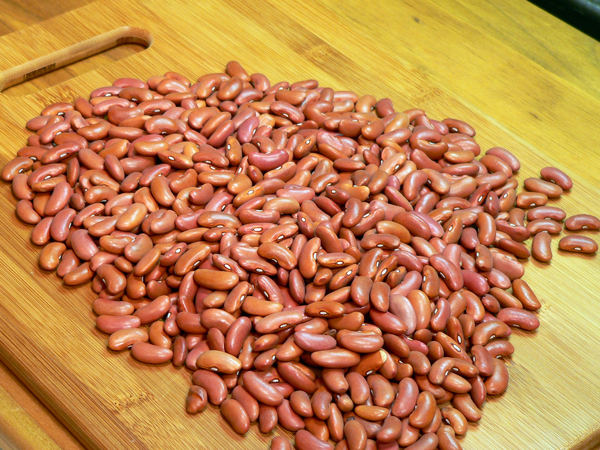 Spread the dry beans out in a large dish or on your counter-top and sort through them. You’ll want to remove any small sticks, rocks, or other foreign items you might find. Also, remove any shriveled up and bad looking beans that might be included. Beans are usually harvested by mechanical means and it’s just natural to find these type of things in any given bag of dry beans. Just throw the bad parts away. I like to place the sorted beans in a colander next and run some cool water over them to rinse away any dirt or dust that might be on them. 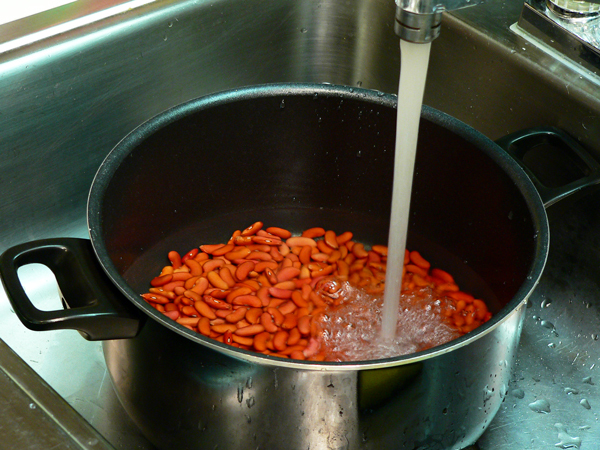 Place the rinsed beans in a large pot and cover them with several inches of cool water. Set them aside and let them rehydrate overnight or for at least 6-8 hours. You’ll probably also find some directions on the bag the beans came in for ways to do a quick soak if you need them sooner. 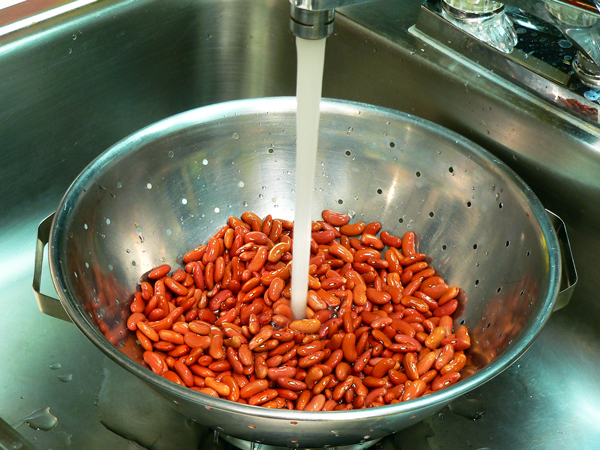 The next day, drain the dirty water off the soaked beans and rinse them once again under cool running water. See how they have plumped up? While the beans are draining, dice up one medium sized Onion. 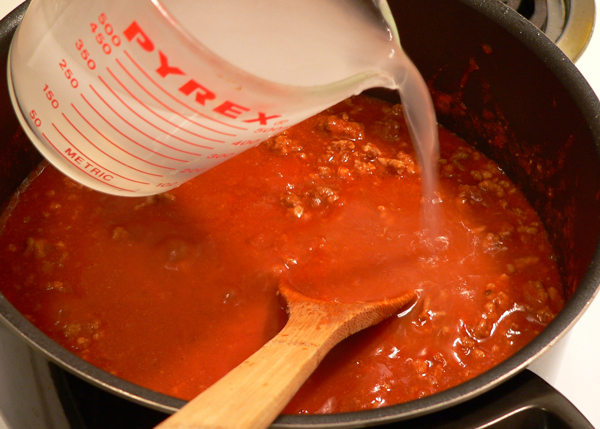 Just rinse out the same sauce pot and place it on your stove. Turn the heat to about medium-high and let it warm up for a minute or two. As I mentioned, I opted not to use as much olive oil as the recipe called for. Instead, I’m using 1/3 cup to saute the onions in. Toss in the diced onions. LOWER the heat back to medium and keep a close watch on the onions. Stir them often and let them simmer for about 10 minutes. Once the onions start to get a little color on the edges and turn translucent, you’re ready to move forward to the next step. 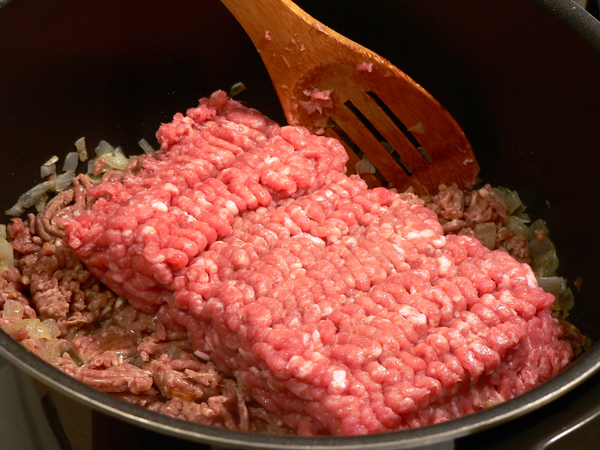 Add the Ground Beef to the pot. Break it up with your wooden spoon or fork and stir it around a bit. A couple of minutes later, do the same with the Ground Pork. Drop it in the pot, break it up and stir it around. 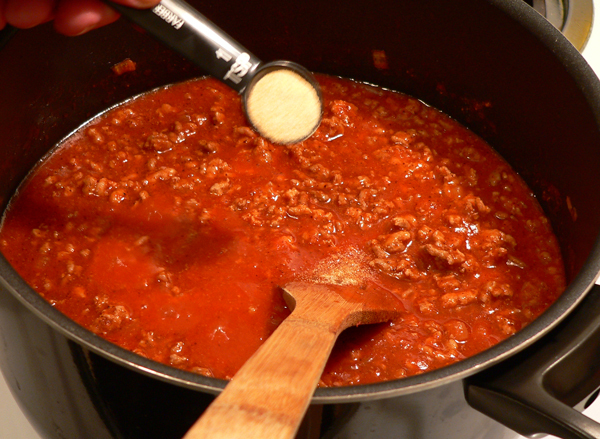 Let the meats simmer over medium heat, stirring often to keep breaking it up. You don’t want the meat to burn so stir often. It will need to simmer for about 15-20 minutes, depending on your stove and heat settings. Just let it brown and don’t overcook it. Once most of the meat has browned, it will look something like this. 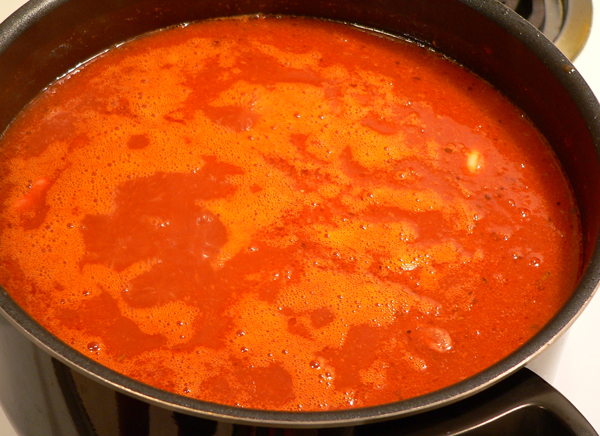 Add the 2 cans of Tomato Sauce to the mixture. Add one Tablespoon of Chili Powder. Add one teaspoon of Garlic Powder. Add one teaspoon of Oregano. 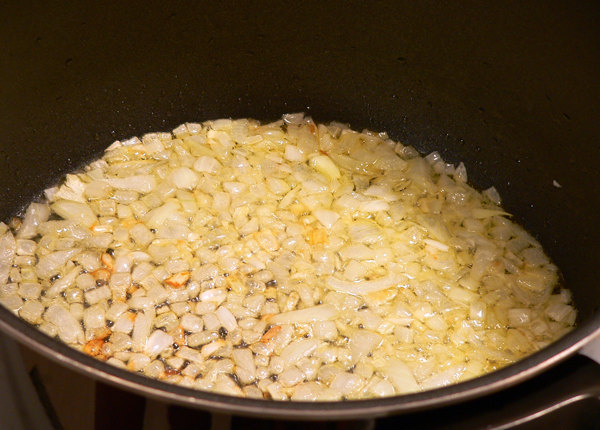 Add TWO teaspoons of Beef Bouillon Granules. Just pretend that I did this one twice… because I did. Add Four Cups of Hot Water. Just use hot water straight from your tap so as not to cool down the cooking process. 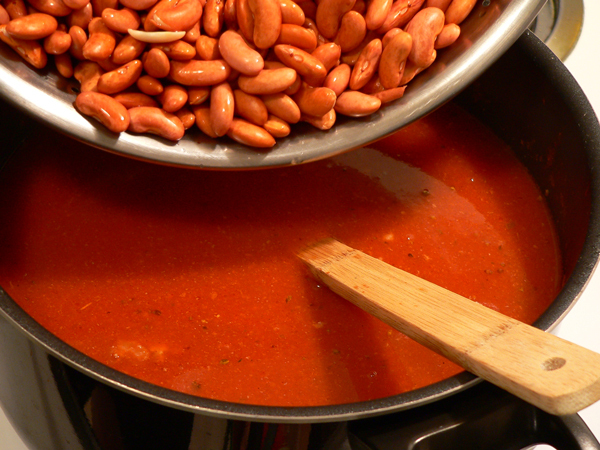 Add the soaked Kidney Beans to the sauce pot… carefully. Stir it all together very well. You may want to raise the heat just a little and let it all come back up to a slight boil. That’s just about the time you start to see some bubbles coming to the surface and popping. Cover the sauce pot with a good fitting lid. The lid on my pot has an adjustable vent built in. I normally open it up completely to allow steam to escape. REDUCE the heat down to about Medium-Low and let the pot simmer for about 1-1/2 to 2 hours, or until the beans are done to your liking. You’ll need to stir the pot about every 30 minutes or so to be sure nothing is sticking to the bottom. A slow simmer is best. Add one teaspoon of Salt. You may want to add more or less depending on your personal tastes. You just need to start off slow and add more as you go if you think you need a bit more. Add one teaspoon of Cocoa Powder. Add one teaspoon of Black Pepper. TASTE TEST: Stir everything together very well and let it simmer for another 10 minutes or so. Give it a little taste test and make any adjustments as needed. You might think it needs a little more of the Beef Bouillon Granules for more of a beefy flavor, or perhaps a little more salt or pepper. Just make it your own recipe for you and your family. If you do add something, make a note of it for your recipe box for next time. Chili with meat. 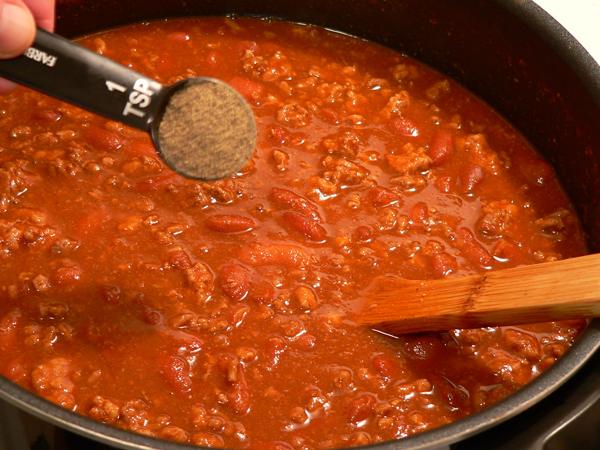 Chili-con-carne literally means chili with meat. This may not be a true hand me down Taste of Southern recipe from my family heritage, but every once in awhile, you find a recipe that you just want to try out. You may not know exactly what intrigues you about it, you just know that you want to cook it and see what it tastes like. 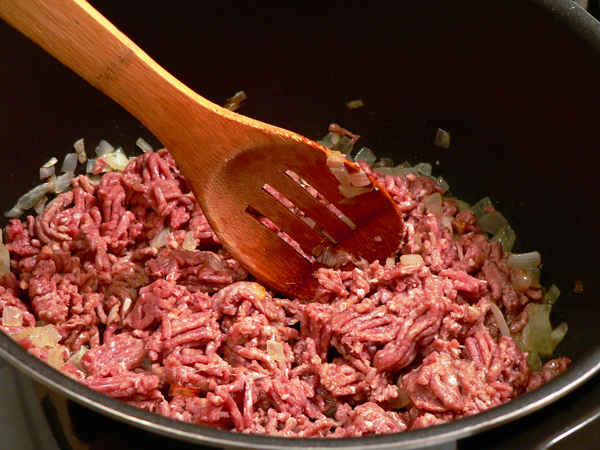 2 – lbs of Ground Beef, About 15% fat content if possible. 1 – lb. of Ground Pork. 1 – lb. bag of dry Light Red Kidney Beans, soaked and drained. 2 – 8 ounce cans of Tomato Sauce. 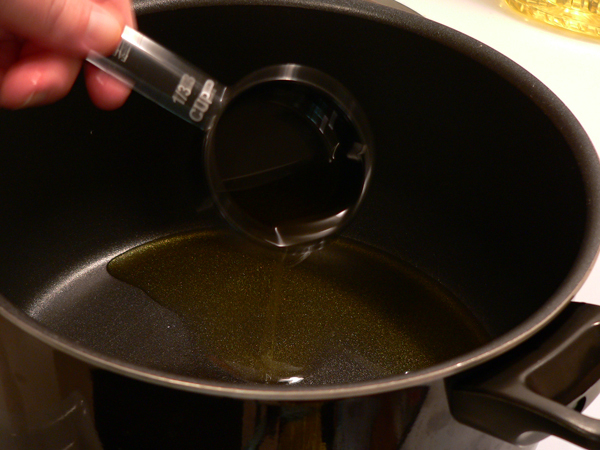 1/3 – cup of Olive Oil. 4 – cups of Water. 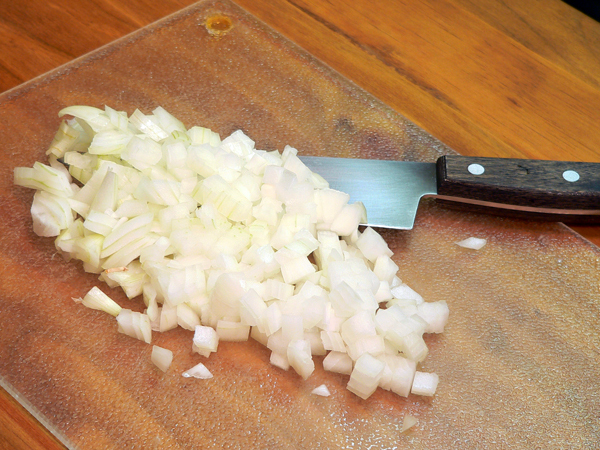 1 – medium Onion, diced. 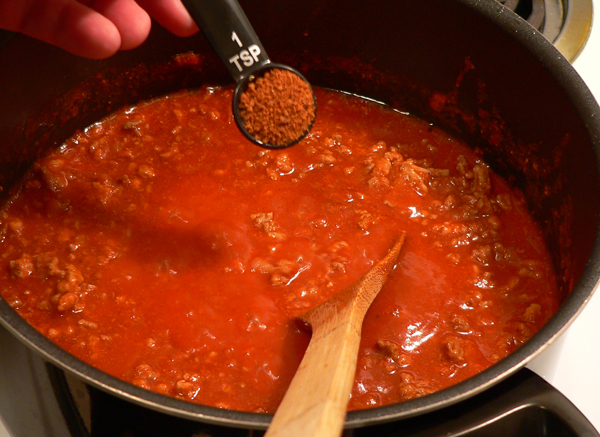 1 – Tablespoon of Chili Powder. 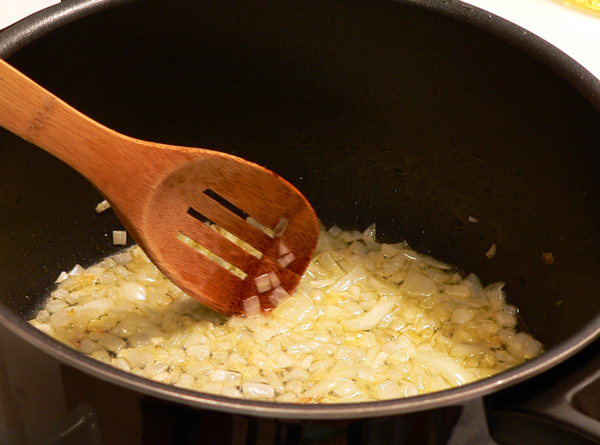 1 – teaspoon of Garlic Powder. 1 – teaspoon of Oregano. 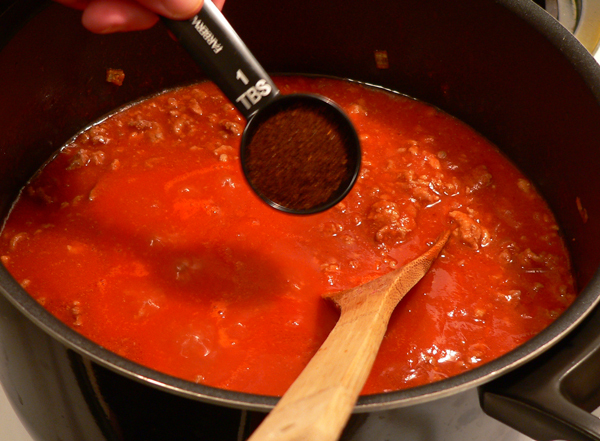 2 – teaspoons of Beef Bouillon Granules. 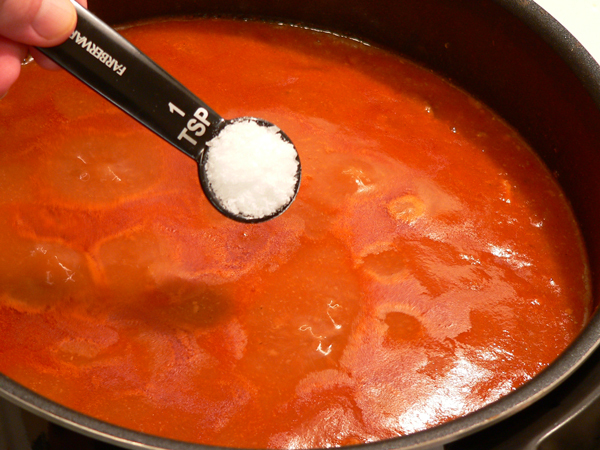 1 – teaspoon of Salt. 1 – teaspoon of Cocoa Powder. 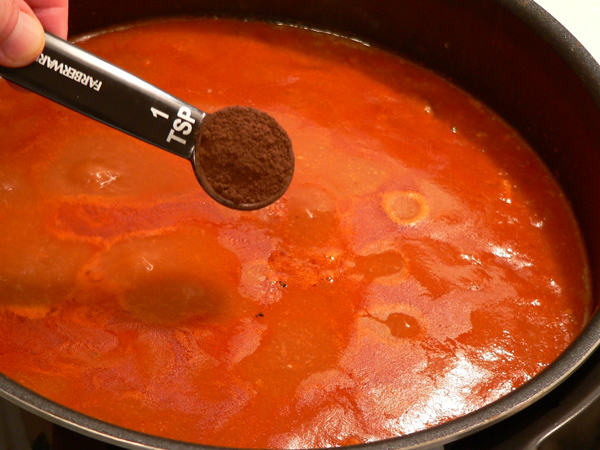 1 – teaspoon of Black Pepper. Spread the dry beans out in a dish or on your counter to sort through them. Remove any bad looking beans, sticks, rocks or other foreign objects. Place the beans in a colander and rinse them well under cold running water. 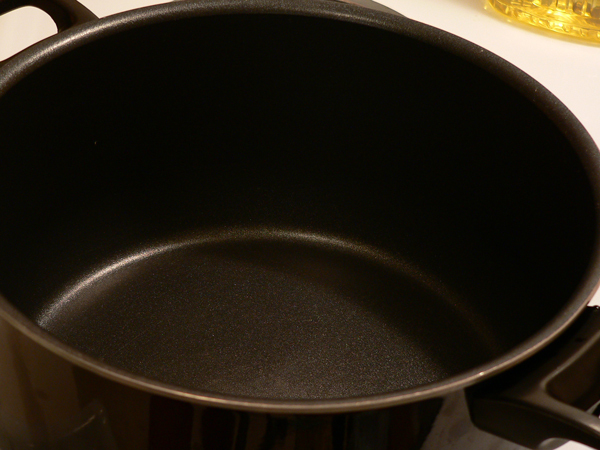 Place beans in a large pot and cover with about 4 inches of water, let soak overnight. 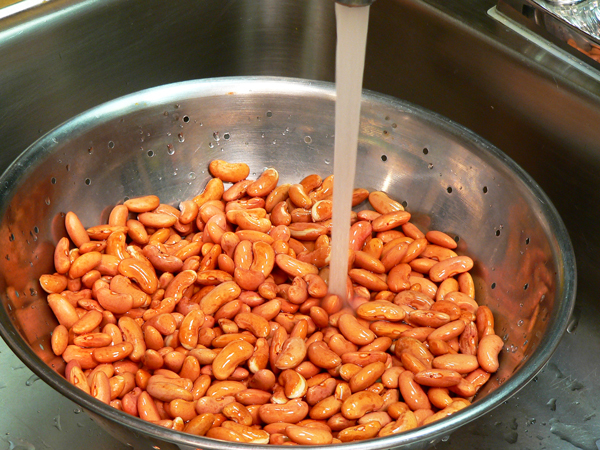 After soaking, pour the beans back into the colander and rinse again under cold running water. Set aside and let them drain. 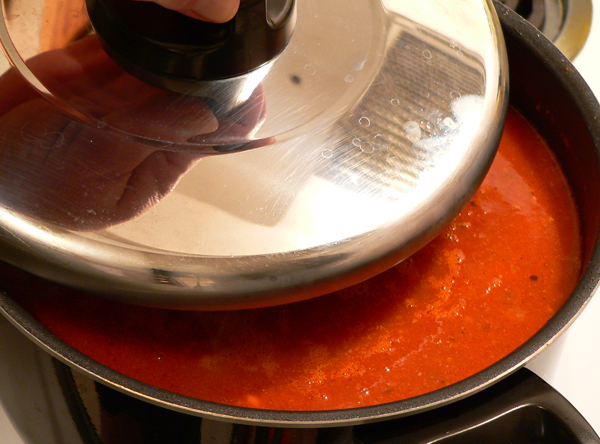 Place a large pot on the stove, set heat to medium-high and let it warm up for a minute or two. 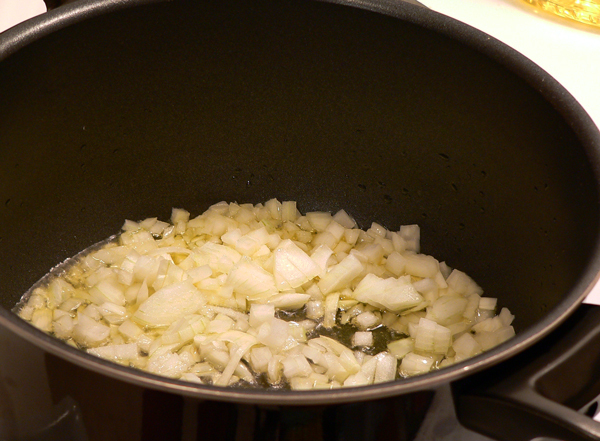 Now, add the diced onions to the pot and stir them around. Let them simmer until they start to turn translucent. 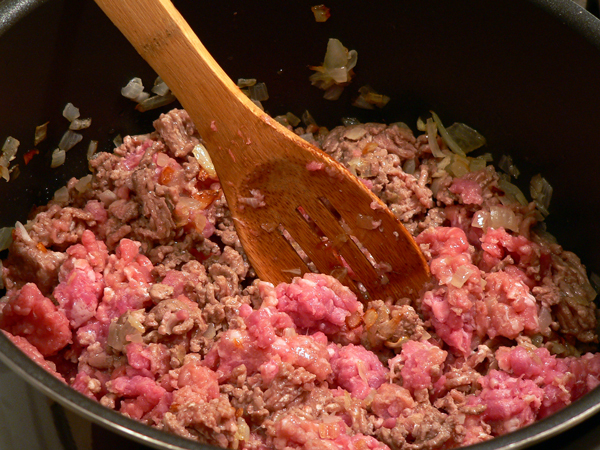 Add the ground beef to the pot, break it up and stir it into the onions. 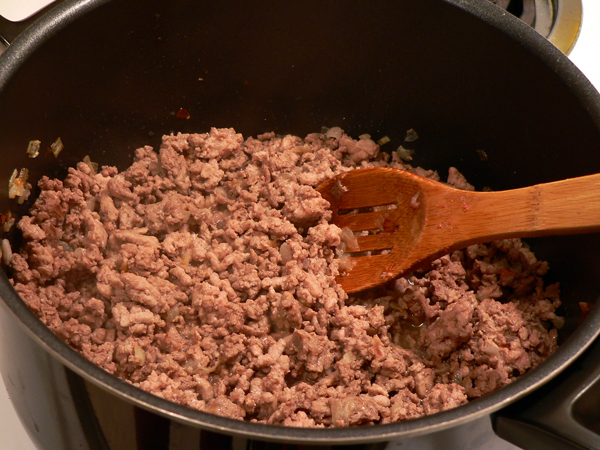 Add the ground pork, break it up and stir into the rest of the mixture. Let this simmer over medium heat for about 20 minutes, stirring occasionally so it doesn’t burn. 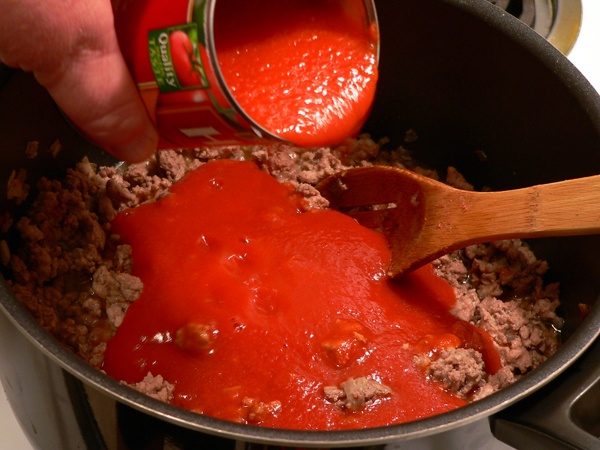 Add the 2 cans of Tomato Sauce, stir well. Add the Chili Powder, Garlic Powder, and Oregano, stir into mixture well. Add 2 teaspoons of Beef Bouillon Granules. Add 4 cups of hot water. Add the beans and stir well. Raise the heat to about medium-high and let the pot come back up to a slight boil. 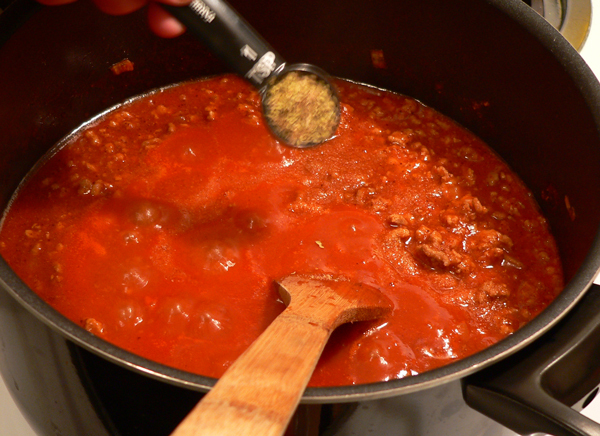 Cover the pot….REDUCE the heat back down to medium-low and let simmer for about 2 hours. You’ll need to stir it about every 30 minutes just to keep an eye on it and make sure it’s not sticking to the bottom of the pot. After the beans have cooked to your satisfaction, remove the lid. Add 1 teaspoon of salt, one teaspoon of cocoa powder and one teaspoon of black pepper. Stir well. Cover again and let simmer for about 10 more minutes and then it’s ready to serve. 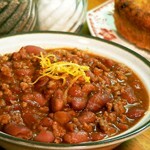 Top this Chili Con Carne with some shredded cheddar cheese and serve with cornbread or a hot toasted cheese sandwich. Your Comments: Please let me know if you visit our website. It only takes a minute or two to leave me a comment in the section below. It’s the only way I’ll ever know that you stopped by. I’m always interested in learning if you try one of our recipes and how it turns out for you. I’m also interested in hearing your comments on our website. Just let me say, Thank You in advance for your visit today. Photo Credits: Warner Baxter images are copyrights of their respected owners if any or public domain. I’m going to try your recipe but I will be adding cumin. When I was young we lived in New Mexico. My father worked construction with many Mexicans and our families socialized, swapping recipes, etc. One of my favorites was chili. My parents are gone now and I regret not paying more attention when they cooked. I do know that cumin was always used in chili. Now I can’t imagine making chili without it. This is my favorite chili recipe. I cooked it over the campfire when I went camping with my friends and they thought I was some kind of chili master. Can’t recommend this enough. One suggestion though – add 2 chopped jalepenos in with the onions to give it a little kick. Just found you but will definitely bookmark your site! I have kids that don’t like onions. My mom always just boiled them and insist that was good enough. However I have found that caramelizing them first (like you did) actually DOES make them virtually disappear. Even my non-onion-eaters will eat beans, chili, or other dishes that just aren’t the same without an onion in them. So to moms with picky eaters… just make sure you clarify those onions REALLY well… (and don’t mention them). Thanks for this comfy looking recipe. My husband is an evangelist just starting in the ministry, and money is really tight. This looks perfect! After you have done all the steps prior to adding the beans and the last couple of ingredients can you finish by using the crock pot on low heat? Hi Yvonne, I’ve never used a crock pot for the recipe, but I don’t really know of any reason why it wouldn’t work. Perhaps a heat a bit higher than the absolute lowest point though. I do hope you’ll try our Chili Con Carne, and if you use that crock pot, please let me know how everything turns out for you. Love the chili recipe. Sounds like my late husband’s chili. It was delicious. I found your site a few months ago and love your recipes and the stories that go with them. This chili sounds good and I can’t wait to try it, but I’m going to wait until it gets cold again. Nothing better than chili on a cold day!